The National Shop Stewards Network headlines this week’s bulletin by calling on all our supporters and affiliates to support the RMT co-ordinated strikes in four train companies on Tuesday October 3rd and Thursday October 5th: Southern Rail, Merseyrail, Arriva Rail North and for the first time on Greater Anglia. 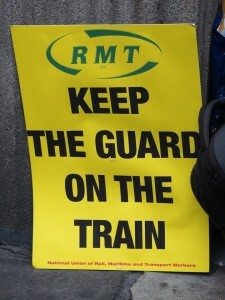 We also echo the RMT’s call for all the train companies to be brought back into public ownership. 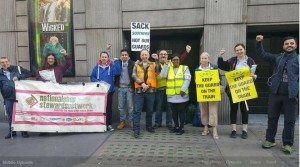 RMT members have been taking strike action against the introduction of Driver Only Operations on Southern Rail alone for 17 months. Now the battle has been widened to these four companies, with disputes also looming on South Western Railway and the Wales and Borders Franchise. RMT has balloted both drivers and guards members and over 200 Greater Anglia guards, on a whopping 90% turn out, have voted by a massive nine to one for strike action. The drivers vote was two to one for action on a 75% turn out. National dispute fund (DOO disputes) – If you would like to donate to the RMT National Dispute Fund which makes payments to support their striking members taking part in National DOO disputes then you can donate via PayPal using the donate button below or make a cheque payable to RMT National Dispute Fund and send it to the address below. Alternatively, you can ring their Freephone helpline on 0800 376 3706 who will be happy to process a credit card payment for you, or, if you would like to pay via internet banking, please email l.rolles@rmt.org.uk for further details. CWU sends out National Industrial Action Ballot of over 100,000 members in Royal Mail Group – watch video of CWU Deputy General Secretary Postal speaking at NSSN TUC Rally on September 10th here (after 1 hour 25 minutes) and then watch all the rally speakers! Sheffield jobcentre campaign continues with fifth week of strike action (15 Sep) – Our 50 members at Eastern Avenue continue their campaign to stop the closure of the jobcentre with another week of strike action beginning on Monday 18 September. The latest action follows week-long strikes in June and July and a two week strike in August. The closure of the office, which serves one of the most deprived areas of Sheffield, would lead to the removal of a vital public service, and lead to claimants having to travel much further to access the help and assistance that our members provide. The closure would cause particular hardship to the many sick, disabled or people with caring responsibilities who use Eastern Avenue. ~A loss of 4.5hrs per week which cost staff 12% of their wages. ~A loss of 8 working weeks per year which cost staff 13% of their wages. ~A loss of £1200 per year special classroom allowance. From Ritzy workers in Brixton: We can’t believe it but we’ve been striking for a year! Yes, that’s right – a year! On Saturday 23 September we’ll be ON STRIKE and out in Windrush Square celebrating our anniversary and showing Picturehouse and Cineworld Cinemas that we WILL NOT GIVE UP! Please join us! 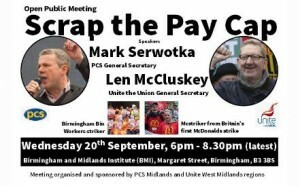 More details about times of picket lines and things to look forward to COMING SOON! Every day until strike day we’ll be posting up some of our favourite photos from the last year so WATCH THIS SPACE. See you on the 23rd, and as ever, THANK YOU for all your support. Together we will win! The nurses, midwifes, medical assistants and ODPs of Charité Hospital in Berlin announced a strike starting at Monday 18th of September. Two years ago they went on strike for eleven days and fought successfully for an agreement on staffing levels in the hospital which set an example nationally. (more information here: http://socialistworld.net/index.php/component/content/article?id=7257:Germany:-Indefinite-strike-for-more-staff-at-Charit#233;-hospital&catid=71&Itemid=114) However the Hospital avoided effective improvements as they were cheating in statistics or openly violating the agreement. Still the nurses are overstrained. During the night 64 percent of nurses work alone on the ward. One in three nurses is on the line of burnout. In Germany on nurse is responsible for 10.3 patients. One of the worst ratios in Europe. The workers of Charité hospital and their union ver.di fight for binding staffing levels and more personnel. 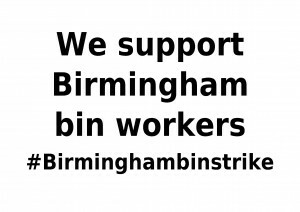 Please support the strike with messages of Solidarity. Messages by health care workers and unions are especially welcome. Photos could be printed out and presented at the picket.